Electrical tape need not apply. Designed by Arundel specifically to provide a clean finish for wrapping handlebars, these will work with pretty much any set up in your garage. 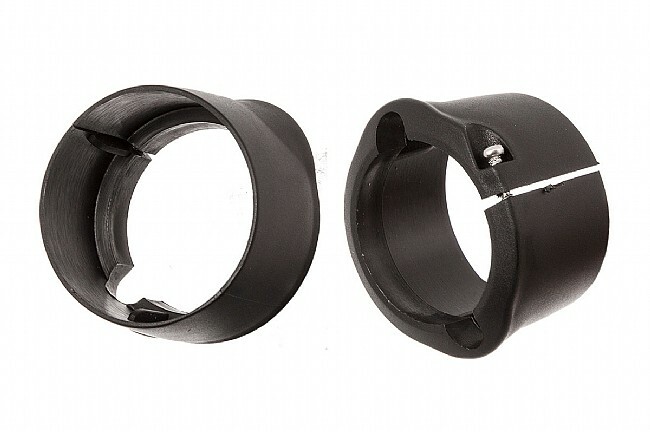 Compatible with single or dual cable routing and able to fit most bar diameters, these handy clips will relegate the electrical tape back to the toolbox. Comes as a pair (enough for one bike). A great idea... to bad they don't work. I couldn't get them to fit anywhere on my Salsa Cowbell 3 bars on my commuter bike that gave a reasonable amount of coverage on the flats. They would fit on the narrow section, but that didn't give nearly enough room on the flats. They don't fit anywhere on the tapered section, and most certainly not on the full size section around the clamp. I like the idea of a clip vs tape, cut these didn't work out as planned. They don't seem to clamp all the way around your typical 31.8 handlebars like my Ritchey Classic. I'm not even sure if they would around old retro handlebars as I attached them at the thinnest part of the tops I could find, not the fat and tapering sections. I took them off and used the tape again. Hopefully someone else will figure out how to make these work. So I bought these to try because I was tired of the black tape look. First, for a proper fit, your cables need to be in their correct place to fit snugly wthese. The main problem is that there's only one screw(thats threaded into plastic) on only one side of the clip! The other side of the clip won't fully close flush because the screw is on the other end. You need to be very careful not to over tighten the screw because it's just going into plastic and it's easily stripped out. Bottom line- I'm using tape still. Product description should detail what handlebar diameter these will fit. Not mine. Cool and interesting accessory. Works pretty well although the tiny screws are hard to work with ... you need tiny electronics screwdriver and the flat blade works best, Once installed they really look much better than electrical tape. My only gripe is the connection method is a bit weak ... something more substantial would be better. It is a great fit to a finish.